The Gulf of Napoli is among the most historic and romantic getaways in Europe and is located on the south west coast of Italy opening on to the Mediterranean Sea. 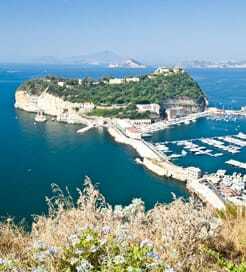 Within easy access is Naples itself, the ruins of the Roman cities of Pompeii and Herculaneum, Sorrento and the islands of Capri and Ischia off the coast, as well as destinations further inland. 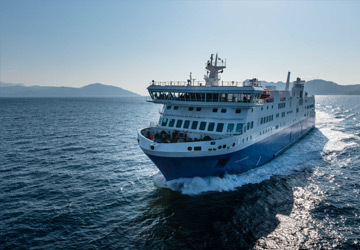 Ferries operate out of Naples to a range of destinations including Capri, Sorrento, Palermo in Sicily and the island of Ischia. There are also sailings to the Aeolian Islands of Lipari, Panarea, Salina, Stromboli, Vulcano, which have crystal-clear waters and stunning scenery and which are ideal for water sports such as snorkelling, scuba diving and sailing. Or head for Cagliari on the island of Sardinia, Catalina on the east coast of Sardinia, the islands of Ustica and Procida and the Aegadian Islands. From the Gulf of Napoli, many people opt to negotiate their way around the area by car, taking advantage of the good road network available that includes much motorway. But be warned, the roads around the coast that hang vertiginously over the sea, are very narrow, feature many hairpin bends and are not for the faint-hearted. They also get very busy in summer. Driving in Naples itself can also be considered a rite of passage with difficult driving conditions. Away from Naples and the coast though, things are easier. Naples is on the A1 North-south auto route to Rome and Milan and the A3 south to Salerno and Reggio di Calabria. For more information, please visit our Ferries from Pontine Islands to Gulf of Napoli page.